I am so excited today to be teaming up with Olive and Piper for their one year anniversary celebration. Olive and Piper is one of my favorite places to shop for affordable but gorgeous jewels. For their first birthday they are celebrating with 5 days of giveaways. They are releasing a new jewel and having a giveaway with five of their favorite bloggers. I am so excited and honored that they picked me to kick of the celebration. Can we talk about how gorgeous this necklace is? I was immediately drawn to this necklace because of the colors, they are perfect for Fall. And when I found out that Olive and Piper was going to let me name the necklace I knew I wanted to simply call it "Jade" because of the green and this necklace reflects my style perfectly... This necklace is simply gorgeous and it is the perfect statement piece. Now time for the giveaway! Use the Rafflecopter widget below to enter for a chance to win a $50 gift card to Olive and Piper and add some gorgeous jewels to your collection. My Olive and Piper pieces are some of my favorites and I wear them all the time! The giveaway will run for a week. Be sure to complete all of the entries to have a better chance at winning. Good luck! You look so lovely here, Jade! I especially love how vibrant and fun all your accessories are. Cheetah-print shoes and a big sparkly statement necklace are always so much fun and a great way to give every outfit more personality! I love cobalt and emerald together Jade! You look gorgeous in these photos. I would love to weat this necklace with my polka dot button up blouse! 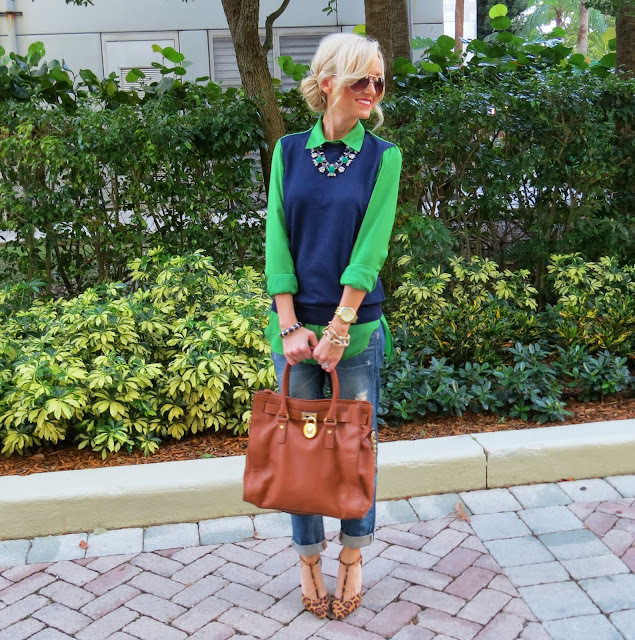 I like wearing a casual outfit with my big baubles to make them stand out, so I would probably do a chambray top, dark jeans, and tuck it under the collar (jcrew style!). Thanks so much for the giveaway! Id wear that necklace with black skinny jeans and a plain white tee to make it stand out more.. Throw on a leather jacket and I'll be all set! black top and dark skinnies! I would wear it with my blue polka dot top and a striped blue shirt underneath, It would be adorable! I would wear it with a pair of jeans and my new pumps that are blue! Love this look! You hair looks amazing! Great giveaway! I would wear it with a navy sweeter, layered over a white button down shirt and tan skinnies! with a cream colored shirt! I would wear it with black and white stripes so that the colors really pop! Thanks for having this giveaway! I would work this with a white tee, baggy navy cardigan, and faded jeans. I'd pair it with a white tee and a cobalt blue maxi skirt, topped with a denim jacket. I would wear it with a white tank, my gap blue and white stripe maxi skirt and then my pewter sandals to top it off. And I add to it I'd rock a longer gold necklace too. Super cute! Perfect for dressing up or down. you look gorgeous! LOVE the outfit and necklace!! I'd wear it with my leather peplum top, black & white "pajama" pants, blue heels and a red lip to let the necklace stand out! I would rock it with a bright pink top and black skirt so the necklace could really stand out!